August 8, 2018, Adrian, Michigan – Adrian Dominican Sisters, Associates, Co-workers, family members, friends, and colleagues of Sister Janet Capone, OP, gathered August 5-6, 2018, for two days of formal and informal services to honor the former Prioress of the Adrian Dominican Sisters. 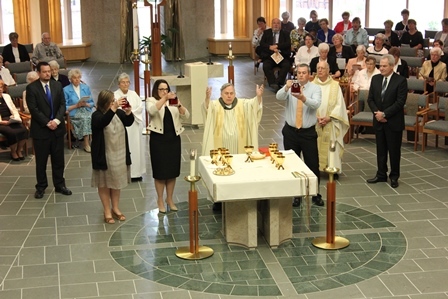 The special days included an August 5 wake and Vigil Service, during which participants shared their personal memories of Sister Janet, and the Funeral Mass and Rite of Committal on August 6. Participants also had the opportunity to share their memories after the formal Vigil Service on August 5, during the lunch that followed the Committal, and at various other informal gatherings. Highlights of Sister Janet’s term as Prioress, from 1998 to 2004, included the merger of the Adrian Dominican Sisters with the Edmonds Dominican Sisters. In addition, she and the General Council oversaw the renovation of Holy Rosary Chapel, the construction of St. Catherine Chapel to replace the smaller Maria Chapel at the Dominican Life Center, and the renovation of Weber Retreat and Conference Center. Sister Mary Ann Caulfield, OP, Chapter Prioress of the Florida Mission Chapter, welcomes the assembly to the Funeral Liturgy. 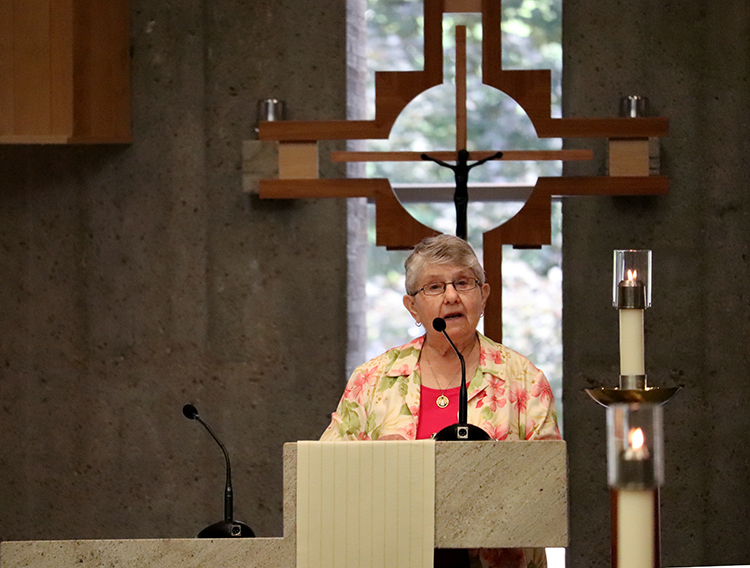 During the Vigil Service on the evening of August 5, Sister Mary Ann Caulfield, OP, Chapter Prioress of the Florida Mission Chapter, gave a eulogy, focusing on the life of Sister Janet. Read some of the details of her life here. “One of the outstanding gifts of Janet was that she would invite people to meet in that field, where one is known and accepted, right or wrong, and here we are – blessed persons, each one of us, and especially blessed because Janet Ann Capone came into our lives,” Sister Maureen said. Sister Janet Capone’s family members place the pall on her casket. Sister Eunice Drazba, OP, offers a reflection during the Funeral Liturgy. The formal farewell to Sister Janet concluded at the Adrian Dominican Sisters’ cemetery, where Sister Janet was laid to rest in the circle of discipleship and friendship among other Adrian Dominican Sisters who have joined the Communion of Saints in Heaven. Feature photo (top): Sister Patricia Siemen, OP, Prioress, places into the hands of Sister Janet Capone, OP, vows she made as a Sister. 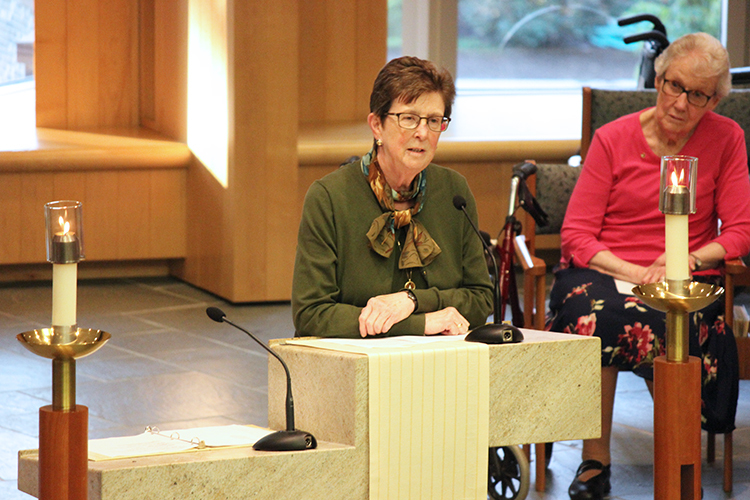 From left: Sister Maureen Comer, OP, who had served on the General Council with Sister Janet Capone, OP, reflects on Sister Janet’s influence and impact. 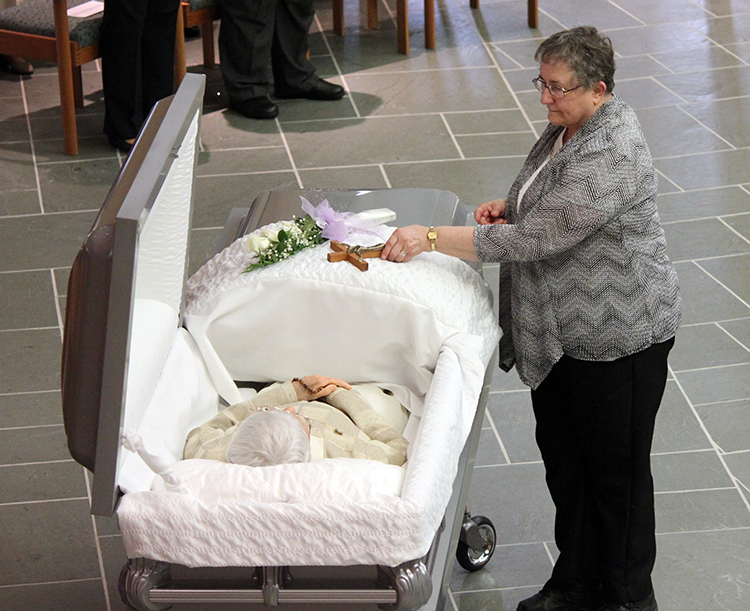 Sister Joan Sustersic, OP, places a cross on the casket of Sister Janet Capone, OP, during the Vigil Service. Sister Patricia Harvat, OP, General Councilor, blesses Sister Janet during the Rite of Committal in the Congregation Cemetery. May 19, 2017, Adrian, Michigan – Several hundred people gathered in St. Catherine Chapel at the Adrian Dominican Sisters Motherhouse May 18-19 to bid farewell to Sister Nadine Foley, OP. Sister Nadine was Prioress of the Congregation from 1986 to 1992 and was an influential figure in religious life. Attending the Vigil Service and Funeral Liturgy were Adrian Dominican Sisters and Associates, nearly 40 family members, representatives of other religious orders, and Sister Nadine’s former students and colleagues. 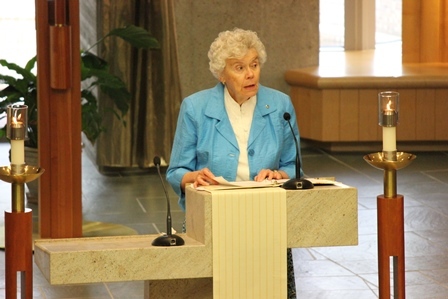 The Vigil Service on May 18 gave the assembly the opportunity to welcome Sister Nadine’s body, reflect on Scripture passages, to share personal stories about Sister Nadine, and commend her to God. 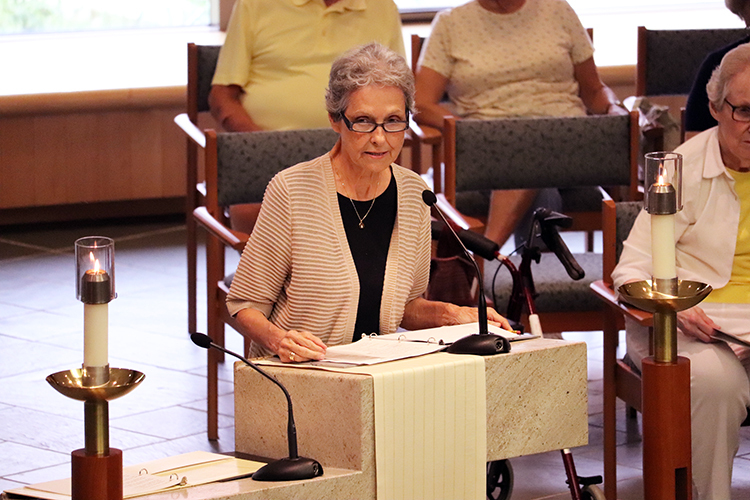 After the Scriptures were proclaimed, Sister Mary Jane Lubinski, Chapter Prioress, led off a period of personal sharing with a summary of Sister Nadine’s life and influence. “It is no easy task to tell the story of this accomplished woman – author, preacher, teacher, vocalist, leader, advocate for women’s rights – the list goes on,” she said. Sister Mary Jane shared Sister Nadine’s life story through the framework of two instructions by St. Catherine of Siena, great Dominican mystic and reformer: “Be who God meant you to be and you will set the world on fire” and “Proclaim the truth and do not be silent through fear.” Sister Nadine found her voice through her years as educator, leader of the Adrian Dominican Congregation, leader in religious life throughout the nation, and advocate for women’s rights, Sister Mary Jane said. “Nadine, you were all that God meant you to be and you did, indeed, set the world on fire,” Sister Mary Jane said. Members of the 1986-1992 General Council who served with Sister Nadine spoke in turn on Sister Nadine’s influence on their lives and in their leadership. Sisters Sharon Weber, OP, and Donna Markham, OP, described Sister Nadine’s as trusting the Holy Spirit and being an extraordinary mentor of leadership. Other speakers recalled their own special memories of Sister Nadine, sharing them through touching and humorous stories. Tricia Foley and Michael Foley – among the youngest of Sister Nadine’s seven siblings – shared stories of experiencing her as an older sister who had already left home before they were born, and learning through the years to relate to her as a beloved sister. 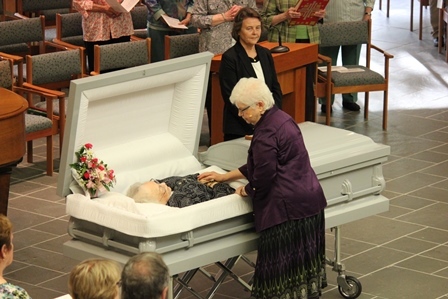 The Funeral Liturgy on May 19 gave Sisters and guests another opportunity to celebrate the life of Sister Nadine and to rejoice in the eternal life that she gained through her death. 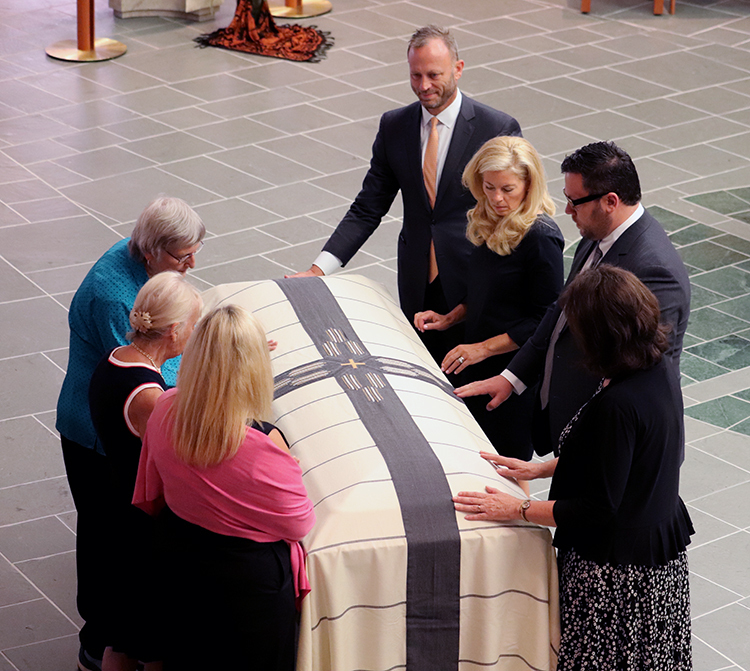 Just as music was a major component of Sister Nadine’s life, so it played a key role in the final celebration of her life. Her niece, Maura, sang a prelude. The Chapel Choir, made up of Sisters and Associates, added to the atmosphere of reverence, hope, and joy as they sang O Sacrum Convivium for their long-time member. 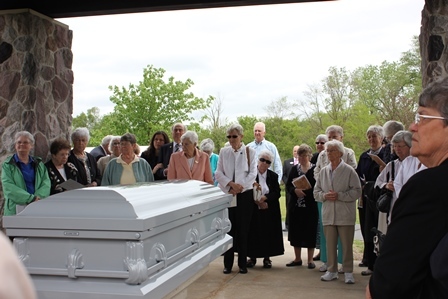 Finally, members of the assembly processed with Sister Nadine to her final resting place in the Congregation’s cemetery, a “circle of friendship and discipleship” for Adrian Dominican Sisters who joined the Communion of Saints in Heaven. 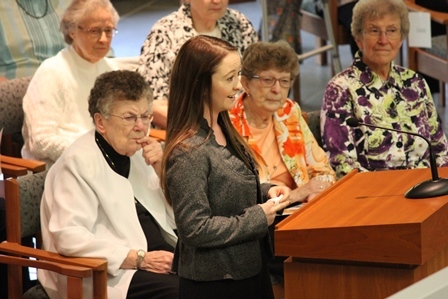 LEFT: Sister Patricia Siemen, OP, Prioress, places Sister Nadine Foley’s vows in her hands during the May 18 Vigil Service, while Sister Elise D. García, OP, General Councilor, looks on. 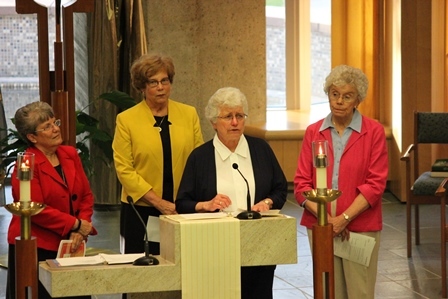 RIGHT: From left, Sisters Linda Bevilacqua, OP, Donna Markham, OP, Sharon Weber, OP, and Attracta Kelly, share their experiences of serving on the General Council with Sister Nadine. LEFT: Sister Nadine’s niece Maura sings a prelude. Shown with her, from left, are Sisters Ann Fallon, OP, Christa Marsik, OP, Carleen Maly, OP and Theresia Scheuer, OP (in back). RIGHT: Sister Attacta Kelly, OP, offers a reflection during Sister Nadine’s funeral. 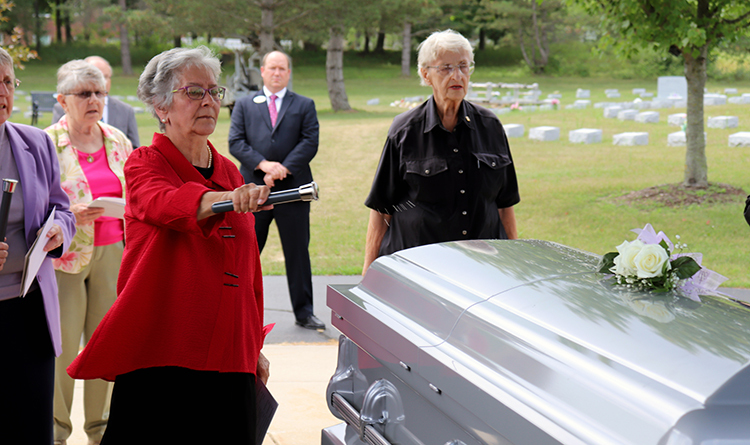 LEFT: Members of Sister Nadine’s family present the offering. Father Roland Calvert, OSFS, stands at the altar. RIGHT: Mourners pray at the commital ceremony in the Adrian Dominican Sisters’ cemetery.